Wireless speakers are not exactly the newest idea on the block, and it is nice to see this particular idea being pushed to a whole new level. Wren Sound Systems takes the next step in the high-end wireless speaker market by introducing the spanking new Wren V5US – which so happens to be the very first wireless speaker that will merge officially certified versions of Apple AirPlay, DTS Play-Fi and aptX Bluetooth. The V5US boasts of Wren’s beautifully minimalist design which will in turn deliver a new standard for superior build quality, genuine wood cabinetry, and elegant simplicity in wireless audio. Even as it boasts of near-universal device compatibility that features both AirPlay and Play-Fi technologies, which in turn opens the door to allow WiFi streaming from Apple iOS devices, Android devices and PCs running Mac or Windows, your entire household will also be pleased as punch to take note that every single person living under the same roof can wirelessly transmit lossless audio from a wide range of smartphones, tablets and PCs – all without suffering any kind of impact where sound quality is concerned. Not only that, users can also hook up to eight different Wren speakers onto a single network, and enjoy perfectly synchronized music across multiple locations, be it at home or at the office. The Wren V5US will allow listeners to stream music to different zones from a single device, not to mention paving the way for multiple users to stream different songs to different rooms via separate mobile devices. 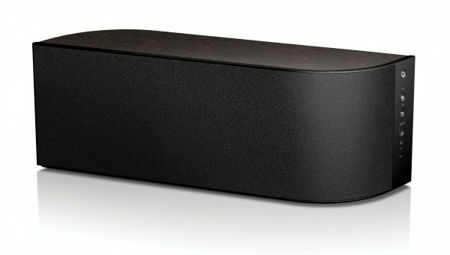 Merging DTS Play-Fi and Apple AirPlay in a single speaker would let lossless WiFi streaming be made available across a spectrum of popular smart devices. Play-Fi will play nice with smartphones and tablets running Android 2.2 and later, PCs running Windows 7, 8 or 8.1 and Apple iOS devices (iOS 6.0 and later) with the Play-Fi iOS app. Expect to pick up the Wren V5US for $499 a pop and change the way your home listens to music!